Christian Krehbiel, the son of John and Katharine (Krehbiel) Krehbiel, was born 18 October 1832 at Weierhof, Germany. He was the third child in a family of 12 children of which six boys and four girls grew to maturity. His ancestry traces back to Switzerland. About 1671 Jost Krahenbühl, under the pressure of persecution, left that country and settled in South Germany. Christian attended school in the Palatinate for five years and then three more years in Bavaria, his family having moved to Kleinschwabhausen, Bavaria, in 1844. He continued to receive religious instruction until the age of 17 as required by law, but was baptized at the age of 15. When Christian's older brother Jacob was drafted into the army, the parents were anxious to shield their sons from military service. So they sold their farm at a great loss, paid 1,000 guilders for Jacob's release, and made preparation to go to America. In 1851, after some difficulty in getting the necessary papers, the family sailed for America, taking 35 days for the ocean voyage. They landed at New York, then continued to Buffalo, Cleveland, and Ashland, Ohio. That fall Christian with another young man took a river boat down the Ohio and up the Mississippi to St. Louis and Iowa to prepare the way for a group of families to come west in the spring. Christian was a strong young man and well able to do hard pioneer work such as cutting trees and helping build a log house and barn on the 100 acres of land which his parents bought for $800. He also became an expert at butchering and an amateur veterinarian. On 14 March 1858 he married Susanna A. Ruth, the daughter of David Ruth, and to them were born 16 children. Nine sons and three daughters grew to adulthood. Two sons were listed in Who's Who. Three sons became ministers. For two years he lived with his father-in-law. During this time he was afflicted with an eye trouble and it was feared he would become permanently blind. In 1860 he moved to Summerfield, Illinois, which at that time offered better farm advantages. 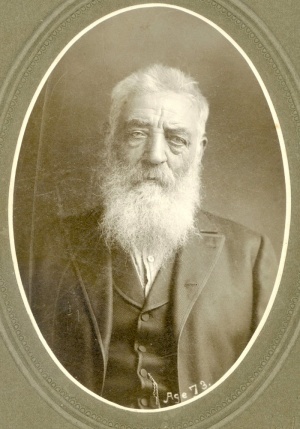 In 1864 by election and lot he became a minister and soon after was made elder of the Summerfield Mennonite Church. In addition to the local church work he had much to do with conference. He promoted the starting of the Western District Conference (later Middle District Conference) in 1868, and then later in 1877 helped organize the Kansas Conference (now Western District). At the sixth General Conference he was asked to be one of three traveling ministers for the Conference. He took an interest in the Wadsworth School development and delivered one of the dedicatory sermons at the opening of this school. Through his guidance, S. S. Haury, a member of his congregation preparing for mission work, was led to offer himself to the conference. This led to the creation of the Foreign Mission Board in 1872 with Krehbiel elected as president, which position he held for 24 years. Along about 1869 he advocated the idea of colonization farther west and this brought him in contact with the Russian Mennonites who came in 1873 to look for land. He played an important part in assisting that large body of Mennonites to make the shift from the steppes of Russia to the plains of Kansas. In order to help the settlers the Mennonite Board of Guardians was formed with Christian Krehbiel, president; David Goerz, secretary, and John F. Funk, treasurer. In 1879 he moved his family to Halstead, Kansas, where four years before an offspring church of the Summerfield congregation had been organized. In connection with the foreign mission work among the American Indians, Krehbiel conducted an Indian Industrial School on his farm in Kansas 1887-1896. When this had to be discontinued, he initiated an Orphan and Children's Aid Society and operated its orphanage in his home 1896-?. He promoted the plan of a school for Kansas and this developed into the Halstead Seminary which was later moved to Newton and became Bethel College. He was instrumental in organizing the Mennonite Charité which aided Dr. Arthur E. Hertzler (the Horse and Buggy Doctor) to build his hospital. Besides farming, he was interested in other business enterprises, helping his sons get started in the flour milling and in the book and publishing business. He served as pastor of the Summerfield and Halstead congregations for 45 years without a salary. When on his 70th birthday the church took a love offering of $400 for him, he turned it over to missions. He died 30 April 1909 and is buried at Halstead. Gingerich, Melvin. The Mennonites in Iowa. Iowa City. 1939. Goerz, Margaret Krehbiel. "Christian Krehbiel." Unpublished manuscript. Hege, Christian and Christian Neff. Mennonitisches Lexikon, 4 vols. Frankfurt & Weierhof: Hege; Karlsruhe: Schneider, 1913-1967: v. II, 565 f.
Kaufman, Ed. G. The Development of Missionary and Philanthropic Interest Among the Mennonites of North America. Berne, IN, 1931. Krahn, Cornelius. ed. From the Steppes to the Prairies. Newton, KS, 1949. Krehbiel, H. P. History of the General Conference of the Mennonites of North America. 1898: I, 428-435. Krehbiel, Olin A. "Krehbiel, Christian (1832-1909)." Global Anabaptist Mennonite Encyclopedia Online. 1957. Web. 24 Apr 2019. http://gameo.org/index.php?title=Krehbiel,_Christian_(1832-1909)&oldid=144252. Krehbiel, Olin A. (1957). Krehbiel, Christian (1832-1909). Global Anabaptist Mennonite Encyclopedia Online. Retrieved 24 April 2019, from http://gameo.org/index.php?title=Krehbiel,_Christian_(1832-1909)&oldid=144252. Adapted by permission of Herald Press, Harrisonburg, Virginia, from Mennonite Encyclopedia, Vol. 3, pp. 235. All rights reserved.